It depends on what you’re sending there. Three years from now, NASA will launch another rover to Mars, where it will scour the surface for traces of ancient life, signs that the planet may have once been habitable. Around the same time, if Elon Musk meets his deadline, SpaceX will send the first commercial spacecraft to land on the planet. About a decade later, humans might arrive, ready to open a new chapter in human history. But where are we going, exactly, when we say we’re going to Mars? Scientists and engineers can spend years poring over images and other data to determine the best landing site for a spacecraft—and rightfully so. Once you’ve sent a very, very expensive hunk of metal somewhere millions of miles away, you only have one shot at getting it on the ground in one piece. Only one country, the United States, has successfully landed something on Mars. With stakes that high, potential landing sites must be scrutinized down to the tiniest details. That’s where Matt Golombek comes in. Golombek is a scientist at NASA’s Jet Propulsion Laboratory in California, or, as he calls himself, “the landing site guy.” Golombek has spent 20 years identifying, evaluating, and helping select sites for Mars missions, starting with the Pathfinder, which delivered the first successful rover, Sojourner, to the Red Planet in 1997. He has constructed dozens and dozens of maps of Mars, pinpointing rocks, slopes, mineral compositions, and other attributes for engineers to use in simulations. Golombek is currently leading the effort to pick a landing site for the Mars 2020, an unnamed NASA rover set for launch in 2020. The rover will be equipped with tools designed to drill and collect samples of rock and soil on the surface, where they'll wait for a future mission to bring them back. He’s also helping SpaceX engineers choose a site for the Red Dragon spacecraft, scheduled to leave Earth the same year, and a potential human journey. “You’re only as good as the last landing site you selected,” Golombek said, laughing, in a recent interview. NASA has gotten better and better at spotting and avoiding rocks as imaging technology improved. 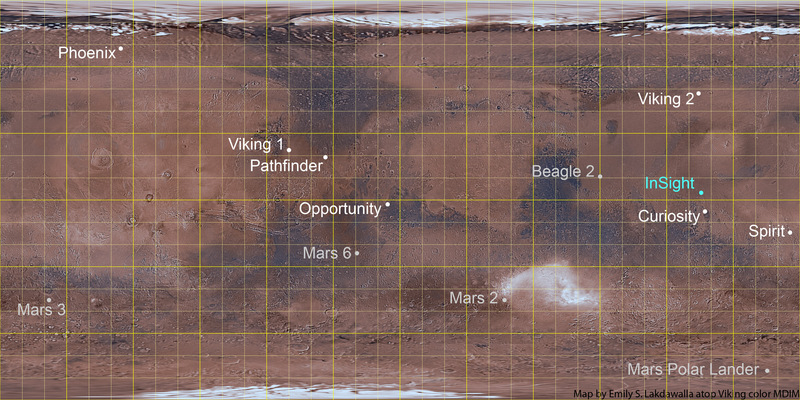 When Golombek was evaluating landing sites for Sojourner, he was using data from the Viking missions, the first orbiters and landers to reach Mars in the mid-1970s. The smallest object the Viking cameras could see was as big as a football stadium. These days, the Mars Reconnaissance Orbiter, which has been orbiting Mars since 2006, can spot the shadows of rocks as small as 1.5 meters (five feet) wide. Two decades of Mars study and technological advances have shrunk the landing ellipse, the oval-shaped spot where engineers determine, after countless simulations, that a spacecraft can land; the landing area is now 500 times smaller than it was during the Pathfinder mission. Golombek said all past and future landing sites have one thing in common: They’ve all been “a smooth, flat, boring place,” Golombek said. Rocky terrain can damage spacecraft, and sloped areas could cause them to tip over. Destinations near the equator are preferred. Temperatures there remain moderate compared to the rest of the planet, which goes a long way in keeping hardware from freezing over in a world where temperature differences between day and night are extreme. Solar-powered spacecraft will also get the most exposure to sunlight at the equator. The equator region is perhaps the most suitable spot for humans, especially if they plan to return to Earth. Mars spins faster at its equator, which would give a rocket traveling in the same direction of the spin a boost in velocity. NASA launches rockets from Cape Canaveral in Florida for the same reason. Landing spots at low elevation are ideal. Mars’s very thin atmosphere is thickest in these areas, and spacecraft can use it to slow themselves down as they descend. Such suitable low-elevation spots are rare on Mars, Golombek said, and this requirement rules out about 80 percent of the planet for potential landings. Those are the basic requirements. The rest depend on a given mission’s objectives. The Mars Polar Lander was sent specifically to study the potential presence of buried water at Mars’s south pole, so there it went—but failed to land successfully—in 1999. The Spirit and Opportunity rovers were charged with exploring Mars’s terrain and geology, so they landed near the planet’s equator, soaking up the sun to stay powered. Phoenix, a rover that remained operational for a few months in 2008, was sent to look again for water, so it landed near Mars’s north pole. The Mars 2020 rover, in its search for remnants of life, will head to areas where scientists suspect water once existed in hot springs, rivers or lakes. NASA has held three workshops since 2014, bringing together hundreds of scientists, to help narrow the list of dozens of proposed targets. Participants spend three days taking turns giving presentations for their preferred landing sites, and then everyone takes a vote. And the discussions can get heated. The most recent workshop, held in February, narrowed the list down to three. The vote wasn’t unanimous, Golombek said, and some participants made their displeasure with the final picks known. Scientists will spend another year and a half reviewing the three sites, meet again, and then present their findings to NASA headquarters, which makes the final call. Future human missions to Mars will present a new challenge for selecting landing sites. The pioneering terrestrials will want to be near the equator, where it’s warmer and easier to depart the planet. But they’ll also need to be near potentially resource-rich ice deposits, which exist in colder regions near the poles. The scientists and engineers in charge of reviewing the best possible targets will have far better data and technology than Golombek did back in the 1990s. But one thing will stay the same: No matter where the landing site is, it’s going to be smooth, flat, and boring.